Dr. Sunggi Baik is the fifth President of Pohang University of Science and Technology (POSTECH) and an authority on ceramic materials. He received his bachelor’s degree in Metallurgical Engineering from Seoul National University, and a Ph.D. in Materials Science from Cornell University where he received the McMullen Fellowship. Before joining POSTECH in 1986 as a Founding Member, Dr. Baik conducted active research at Oak Ridge National Laboratory. Prior to the presidency, he held many senior positions at the University, including Vice President, Dean of Planning, Dean of Student Affairs, Head of the Department of Materials Science and Engineering, and Director of the Pohang Accelerator Laboratory. Dr. Baik has received Outstanding Achievement Award from the International Symposium on Integrated Ferroelectrics (2004), Best Publication Award from the Korean Federation of Science and Technology Society (1994), and Scholastic Achievement Award from the Korean Ceramics Society (1992). 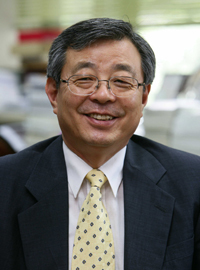 He has also served as Editor of Journal of Materials Research, Journal of Korean Ceramic Society, Ceramics International, IUMRS Facets, and Integrated Ferroelectrics. Dr. Baik’s research areas include application of synchrotron radiation to materials research, surface and interface science of ceramic materials, ferroelectric thin films and nanostructures, sintering and related phenomena, and application of oxide materials to sensors and microwave devices. He has authored over 150 international journal publications and holds 13 patents. Dr. Baik is currently Fellow of the American Ceramic Society, Member of the World Academy of Ceramics, and Member of the National Academy of Engineering of Korea. He is also an active contributor to the science and technology related policymaking, serving as Chairman of the World Premier Materials Program of the Korean Ministry of Knowledge Economy since 2009. Dr. Baik has great interest in the propagation of the value and importance and the higher education of engineering, as well as nurturing global leadership.